The recliner chair has become one of the most multipurpose pieces of furniture one can own in their home. That’s why it’s not strange that many people are looking for the most comfortable recliner chair in the market. Most people use them for movie nights, others just lie down after a long day at work, new mothers use them to feed their babies and cradle them to sleep. Many people can use reclining chairs for lumbar and neck support while they rest, and today, there is a growing number of people interested in finding the best and most comfortable reclining chairs that allow them to sleep in them. We agree that comfort is the main objective of reclining chairs, but in reality, comfort varies with the preference and need of each person. 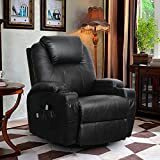 One would say that an electric recliner chair provides the most comfort while the other would go for a massage recliner chair and term it most comfortable. This is simply because they both have different opinions of what the most comfortable recliner chair may be. 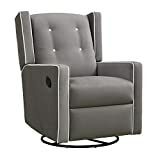 The basic idea of a recliner chair is having yourself sink into the cushy couches, pull the lever or push the button to lift the leg rest and adjust the chair to a comfortable position. Then the next thing they know, they are in comfort heaven. The basic fact is that all recliners are not the same. Given the different comfort preferences and design evolutions in the industry, there are different types of recliner chairs. Take, for instance, a standard two-position recliner chair simply leans its backrest and extends its footrest forward. A rocking recliner has the standard two-position capabilities and is able to rock back and forth. This ideal for parents with newborns. Other forms of recliners include power recliners, heated recliners, massage recliners, sleeping recliners, swivel recliners, lift recliners, and space-saving recliners among others. Swivel recliners do what the name suggests. They are able to move around mostly 360 degrees on a swivel. Lift recliners have a lift mechanism that is electrically propelled to lift you forward and help you get off the chair. Space-saving recliners, on the other hand, occupy less space. They only need to be half-a-foot from the wall. Heated recliners have a heating element installed in them to emit some form oh heat ideal for the winter season. Massage chairs have a vibrating mechanism meant to give the user a massage while seated in the chair. Style is pretty much covered above when talking about the types of recliner chairs. But it is most apparent that the majority of people prefer recliners that can tilt and adjust electrically. The electric function makes it easy and efficient to manipulate. Imagine a scenario where many users are sharing one recliner in the office or at home. An electric recliner can be pre-programmed to different profiles suitable for different users. Later, the settings can be restored by the touch of a button. This capability removes the cumbersomeness of having to start setting your preferences every time someone else uses the recliner. The style also consists of the accessories that come with the chair. Some recliners come with cup holders, others come with side tables that are tucked inside the armrest. But more sophisticated versions have charging ports, consoles to control both the chair and some external electric components like lighting. Some chairs have connectivity capabilities that enable phone apps to control them. Whether they are best recliners for sleeping or best power recliners, some users render a chair comfortable when they can simply sink into them. A function that padding and upholstery are able to facilitate. One should know that the core reason why a chair can be so soft and plush is because of the soft padding in the inner parts of the chair. The padding is normally synthetic foam with the best quality as high-density foam or memory foam. Memory foam takes the shape of the users’ body thus making them comfortable. On the contrary, a soft shredded or viscous foam is likely to provide less support, therefore, be less comfortable. You want to look for a chair with a density of 2.0 or higher. The basic idea behind a higher density is that the foam will not lose its shape easily. You need to skip chairs that have been stuffed with cotton batting as the material tends to shift underneath the upholstery then create an uncomfortable feeling. In most cases, manufacturers use natural or synthetic fibers to upholster recliner chairs. Cotton-polyester blends or pure cotton, as well as microfiber, are the materials used in most cases. These materials are quite comfortable. As a user, you should avoid materials like wool which easily get scratched and run threads giving the chair a bad look. Also avoid vinyl-materialled recliners as they tend to sweat, become sticky and sometimes crack. If the objective is comfort, then leather becomes the best option and also ideal for its aesthetic value. But this has to be the soft and expensive full-grain or top-grain leather. You may also consider velvet if that’s your style. It is not advisable to go for chairs made out of lower quality bi-cast leather or split-grain because they will not do the trick. Recliner chairs either have coil springs underneath the seat or a sinuous spring suspension at the back of the chair. These mechanisms assist the chair not to sag as well as provide the much-needed support. The most comfortable recliner chair will have both. Given the basic information on what constitutes a comfortable recliner chair, users can know what it takes to have the best. Now it is up to them to align their recliner chair comfort opinions with the basic requirements for a comfortable chair. But, it is only fair to go through a list of chairs in at least two categories. The objective is to point consumers in the right direction especially in regards to customer reviews and what product is available in the market. Therefore, the focus is going to be on two types of recliner chairs because we believe that they offer the most kind of comfort. These are the best recliners for sleeping and the best power recliners no matter what the function they are meant for. The model is more accustomed to the nursery section of the home as it is meant for mothers with newborn babies. The chair is ideal for nursing functions like breastfeeding or putting the baby to sleep. While putting the bay to sleep the mother can fully recline the chair into an almost horizontal position and catch a nap with the baby lying on their chests. To support this, the Relax Mikayla is made out of a sturdy frame. The frame supports both the weight of the mother and the child. In a nutshell, the chair has several comfort features pegged to it that you would not want to ever leave the nursery. The chair has a globe bearing mechanism that allows the mother to swivel, as well as a smoothly, glide giving the mother convenience and a full range of movement. The chair features an easy to pull mechanism that enables the user to prop up their legs on the leg rest as well as fully recline the chair into a horizontal position. The backrest is filled with foam and supported with spring cores to keep the foam from sagging. The chair is easy to assemble thus making installing an easy task. It may be a little bit expensive but you need to put into consideration the kind of comfort you will be gaining. Its major drawback is that it could be a little bit awkward when lowering the footrest. You’ve just gotten from work and you are feeling really tired. You think you need a well-deserved nap but you cannot go to the bedroom. The Flash Furniture MEN-DSC01078-BRN-GG should be the solution for such a quest. Why then is the chair one of the best? It has a wide seating surface of 19” W x 21” D meaning that almost everyone could comfortably fit in it. The upholstery is made of quality leather while the padding is thick to curdle your body especially at times of tense physique after a hard days work. The chair reclines to a full horizontal position to enable you to take off the tension from your spine. The chair has rocking capabilities that are surprisingly not noisy when in action. Rocking back and forth is a mechanism that helps you relax or take a deserved nap. The arms, seating, and backrest are heavily padded to cushion your body from any stress. Apart from its large frame and generous padding, the pinnacle for this model is its massaging capabilities. The massaging component concentrates on two regions of your body. One is your back while the other is the bottom base of your body. An ideal setting is that the massaging zones can work independently or together depending on the user’s preferences. You can either set it to massage your back or your base and if you wish massage both regions. Its heavily padded cushions are sewn into the chair thus enhancing comfort and you will not have to worry about wear and tear. The design takes care of furniture falling apart problem. This problem leads to furniture tearing soon after purchase. With this attribute, the user gets a piece of furniture that is durable. The HomCom model is another horizontal reclining sleeping chair with more added features to it. Its structural integrity is intact as the chair is cushioned with extra chunky foam and the leather provides a butter smooth feel. Apart from its reclining range, it adds to its advantage when it includes both rocking and swivel capabilities. The swivel spin is 360 degrees while the rotation is completely controlled by remote. This is a feature not commonly found in most recliner chair designs. Its vibrating massage is heat enabled meaning that the massage is effective in giving your muscles the ultimate relaxing feeling. The above models are not all the best recliner chairs in the market but we have just mentioned a few to guide you towards what to look for in a chair. HEATING FUNCTION BUILT-IN: A heating function in the waist area warms and soothes the body's aches and pains as you sit and recline, meaning that it's not only relaxing, but also beneficial to your overall well-being. SELECTABLE MODES AND LEVELS: No matter what you're in the mood for you'll find it, with five pre-programmed modes and two intensity levels to choose from, so there's something for everyone to enjoy. The recliner is a true definition of excellence and luxury presented in one bowl. On first glance, it seems so simple but it packs a lot of complexity as regards to design and features jammed into it. For it to be considered as one of the best power recliners, it must have formidable qualities. Trying to describe comfort for this recliner is difficult as its nothing short of excellent. It’s like trying to describe the feeling you get from driving a luxury Mercedes Benz. Just to attempt to describe comfort, the chair is made out of pure leather. The design is flawless with a compact headrest and a longer yet seamless leg rest. The headrest is powered and adjustable. Features include a bass shaker that is ideal when relaxing and watching a movie. The SEATCRAFT Equinox Leather Power Recliner has a cup holder for storage and a slide outside table for putting your popcorn bowl while enjoying a movie. This very comfortable recliner chair has a phone charging port as well as ambient lighting underneath it for the movie theatre feel. It also has memory seating for different users. For all this comfort and features, be advised that the chair does not come cheap. The model is considered one of the most comfortable powered chairs made by Ashley Furniture. The design of the chair may not look so good because it seems standard. But this boils to preference as some people may like the saddle color look. Otherwise, comfort is one of its outstanding features. The cushioning and finishing are on a higher level. The cushioning uses thick padding and the upholstery is out of fine leather. When this is included with the wide size, the chair becomes extremely comfortable. The reclining mechanism is maneuverable by both a button and power controls. The power control is essential when getting off the seat as it lifts the user’s feet to a point that they are touching the ground. This way, it becomes easier to stand up. The electric reclining function comes in handy for the older generation. 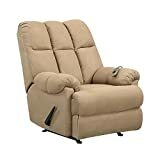 The recliner ranks among the best power recliners because of its added features. It has a nice and modern design to it but is without the technical modern features like a charging port or a side table. 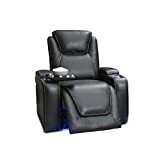 The 360 Degree Swivel Leather Massage Recliner offers its users with an 8-point massage system, the classic rocking function, and 360-degree swivel motion. Both the swivel action and reclining mechanisms are controlled by power. A simple drawback is that the power-controlled swivel moves at a slow pace but where would you be rushing to when on a recliner chair. The padding on the cushion is harder so don’t expect to sink into the chair. The hard padding is actually important for people with spinal issues. The stiff support keeps much stress away from the back and spine and keeps them elevated in one position. This is particularly important for users with back and spinal issues, especially in the lower back region. The chair also has a rocking mechanism though its range of motion is a bit wanting. The heating feature is essential during the winter period as well as when the chair is performing its massaging function. 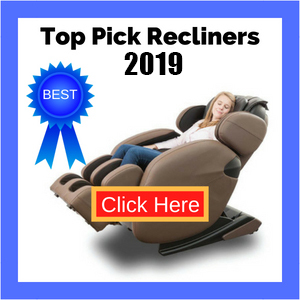 The reclining mechanism is not full range to give you a horizontal outlay but it is comfortable enough to be ranked among the best power recliners. 360 degree swivel and 150 degree recline features.Easily recline the chair and release the built-in foot rest. This high quality chair is made of PU leather and brings maximum comfort to your living area. With the in-depth guide provided, recliner enthusiasts wishing to purchase the most comfortable recliner chair should understand that the ultimate satisfaction on comfort depends on the preference of the user. 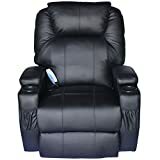 The objective of listing some of the best recliner chairs is to help you compare with other best chairs not mentioned here. With the information provided, we believe that you are in a better position to make an informed decision towards buying your most comfortable recliner chair.